Handcrafted from sturdy rustproof aluminum frames with handwoven vinyl/resin fibers. 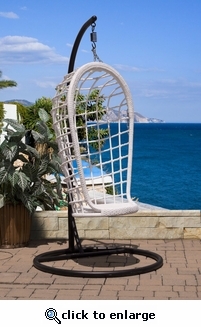 This hanging swing brings back memories of a quieter time when you could just sit back and enjoy a warm sunny day. White or Natural finish.